Me and Louise from Caithness, Scotland. She's wearing her new LL Bean outfit. Mitten KAL thread—I am way behind! Watch Episode 43 of Knitting Dish at www.knittingdish.com to see mittens from the retreat. Mary has a great video cast. It is a cool rainy day as I sit here at the window to write about nature. I enjoy a good rainy day in any season except winter when it is cold enough to freeze and do damage and make the roads slick. This rain is gentle and the sound of it on the leaves is pleasant. Some trees in the woods have already shed their leaves although we still haven’t had the major fall color display. I can see all the way down to the creek that winds through the woods at the bottom of the ravine. There is a fresh layer of mostly yellow and brown leaves on the little clearing of land, almost a peninsula, that is formed where the creek bends sharply. We’ve had nights that are warm enough for the frogs and insects to continue their nocturnal lullaby. Through the open windows flow the cool autumn air and night sounds. One night the Barred Owl woke me up as he…or she…was right outside the bedroom window. There wasn’t enough moonlight to see but I could tell by the volume of the call of the “Eight Hooter” as the Barred Owl is sometimes known. Birds are migrating through and the local birds are cleaning out the feeders. Our hummingbirds are still here. My husband takes the hummingbird feeder in at night because of marauding raccoons. One night he tried leaving it out and although it had been at least a month since we had seen evidence of raccoon bandits, it had obviously been tampered overnight. So each morning my husband notices that a hummingbird is sitting on the hook that holds the feeder. So he says, “I’m coming, just a minute”. 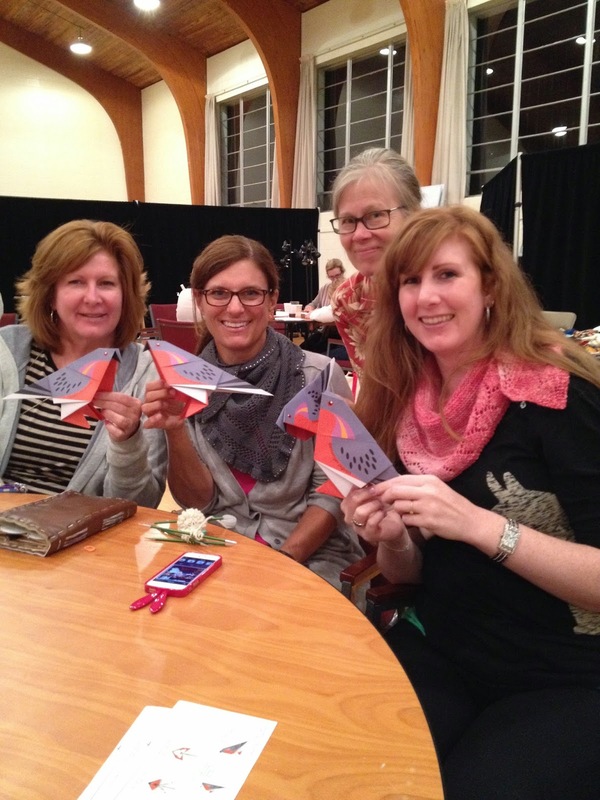 It’s pretty cute to be a servant to a hummingbird. I’ve been watching one now sipping at the feeder and then just sitting there for a while. Earlier there was a downy woodpecker getting nectar from the hummingbird feeder. Last Saturday when I came back from my morning walk a toad was sitting on our mailbox. I shared this photo on Instagram. He very politely posed for me with his eyes mostly closed, as if ignoring my presence. His feet had little suction cups on the ends of his toes so I’m guessing he is a tree toad or frog. I have to admit I don’t know the difference between toads and frogs except that frogs seem to be found closer to water, but I think that is not entirely true either. I found a site for you if you want to read about frogs vs. toads. 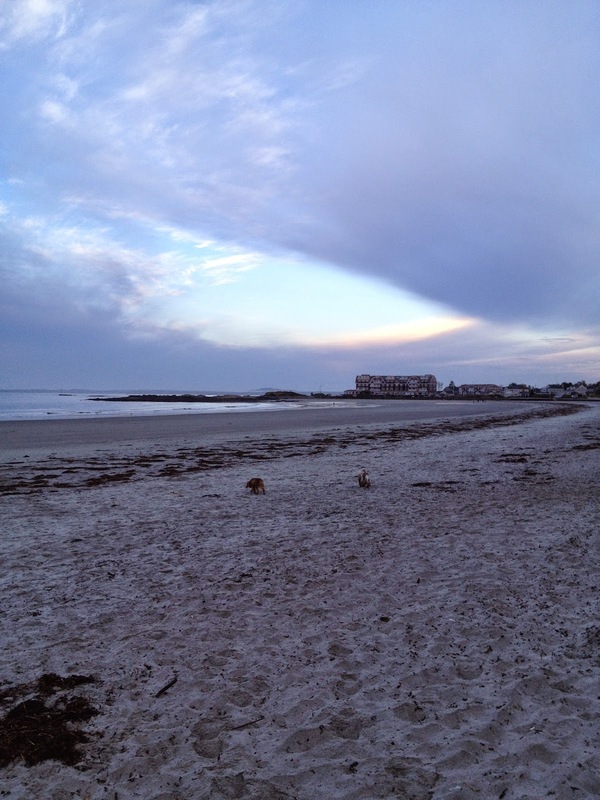 While in Maine I had opportunities to walk on the beach as it was just a short walk from the retreat location in Kennebunk. There were a few houses along the way to the beach with gardens sporting late blooming flowers such as asters, roses, sedum, and brilliant blue hydrangeas. They must have the right soil for hydrangeas there because it seems they were everywhere. On my morning walks on Goochs Beach (I love trying to say that and usually stumble on it) the clouds were almost as glorious as the water. The gray clouds were tipped with the pinks and oranges of the rising sun. The rocks were fascinating too. I’m sure a geologist could tell you a lot about these rocks but if you don’t know a geologist just ask Jaxie985. I saw some photos of her giving rock talks and I want to be in on that next year. I have never outgrown my love for rocks and watching the waves slide over the rocks and sand was mesmerizing. Then there is the sound of the water and the gulls. Who needs to listen to podcasts when you have this kind of morning entertainment? Not me. The only time I used my ipod was on the flights to Boston and back to Illinois. On the Tuesday morning of our retreat, Martha, Jan Marie, and I drove a short distance to the Rachel Carson Wildlife Refuge that is maintained by the U.S. Fish and Wildlife Service. For the first part of our walk we didn’t see any other hikers. The trail was gravel and flat so it is handicapped accessible. There were many viewing platforms. The leaves were starting to turn and in some places the trees were reflected in water. We saw some waterfowl and flycatchers. We also heard a lot of chipmunks and sadly we didn’t know what they were until Martha figured it out later. “Chip” can sound like a bird call note especially when you are hearing them come from the treetops. Lesson learned! Thank you, Martha. As a side note, any birder who will not admit to being tricked by squirrels or chipmunks is probably not entirely truthful. Rachel Carson (1907-1964) was a biologist and writer who is credited with starting the environmental movement with her book Silent Spring. The Rachel Carson Wildlife Refuge is near her summer home in Maine and was so named to honor her legacy. Our quote today is appropriately from the writings of Rachel Carson. 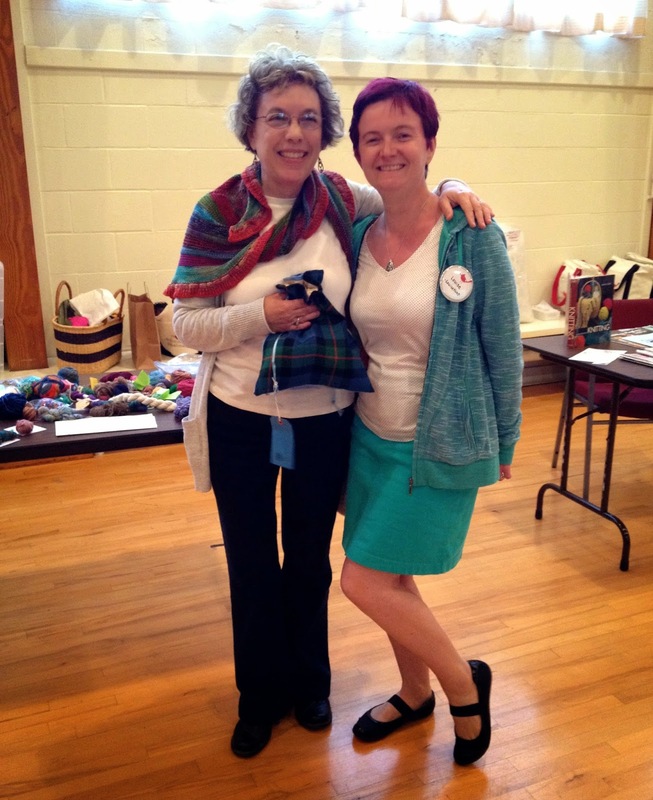 Anne of Little Skein sent a box to the Maine Retreat so I could share with the knitters there. 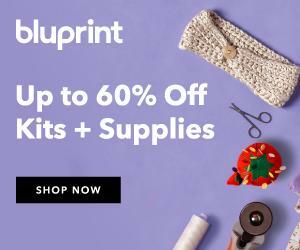 JP Knit and Stitch in Jamaica Plain/Boston. 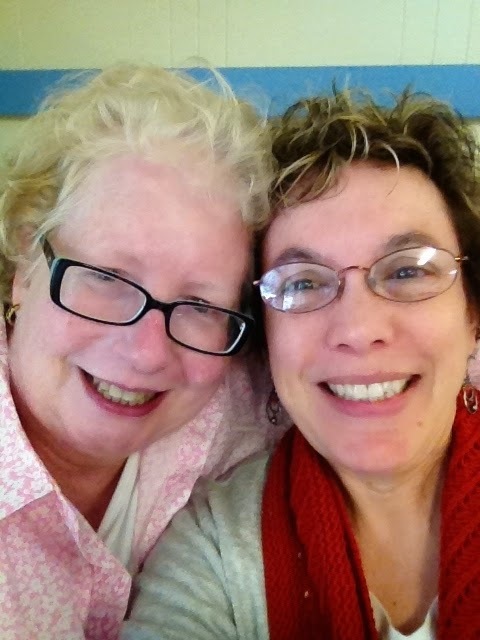 Ladies of the Knit audio podcast. Met two of the three, Susan and Kris. 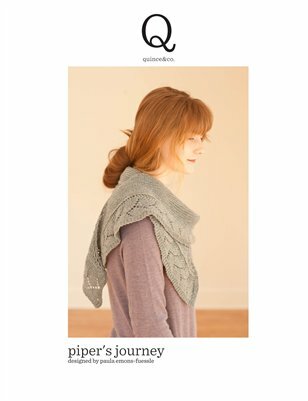 · Lots of Sister Bay Shawls, Upstairs Downstairs, Piper’s Journey, Gills’ Rock…yes I notice each one. Thank you! 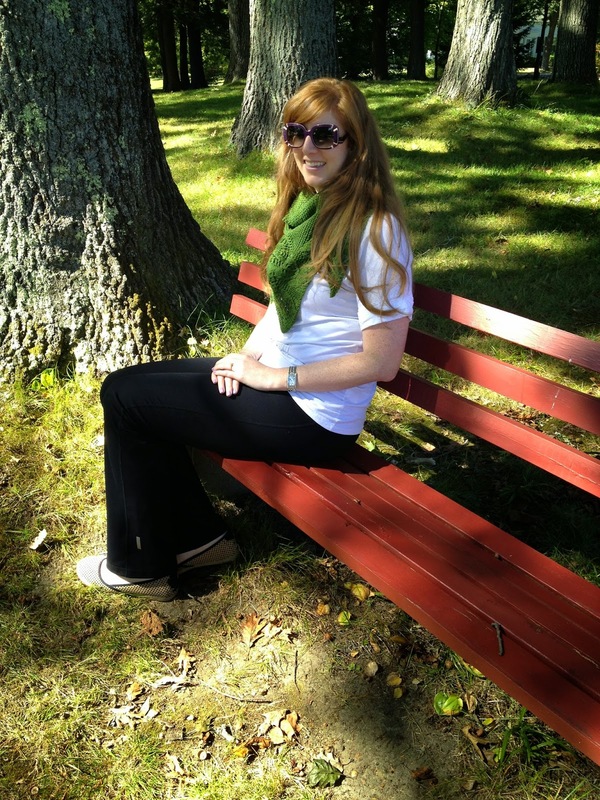 · Color combinations of Sister Bay Shawls were amazing. Sue had one in Camel and Peacoat. Susan aka Guerne knit one in cranberry with brown border. · JanMarie’s Upstairs Downstairs caused quite a stir. Two colors. Thank you to Unicorn Press for sending us beautiful copies of the patterns! 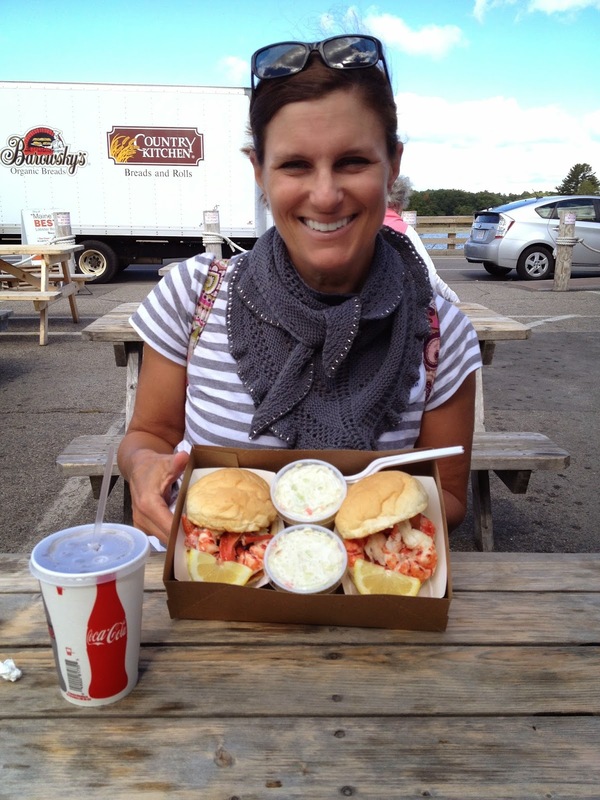 Lobster Roll lunch at The Crab Shack with Susan, Martha, and Lisa. 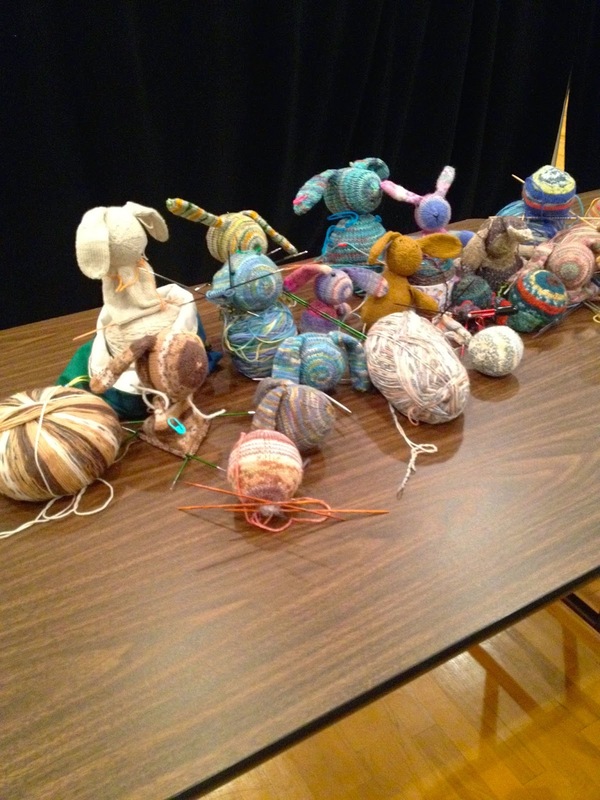 Mitten Show and Tell. 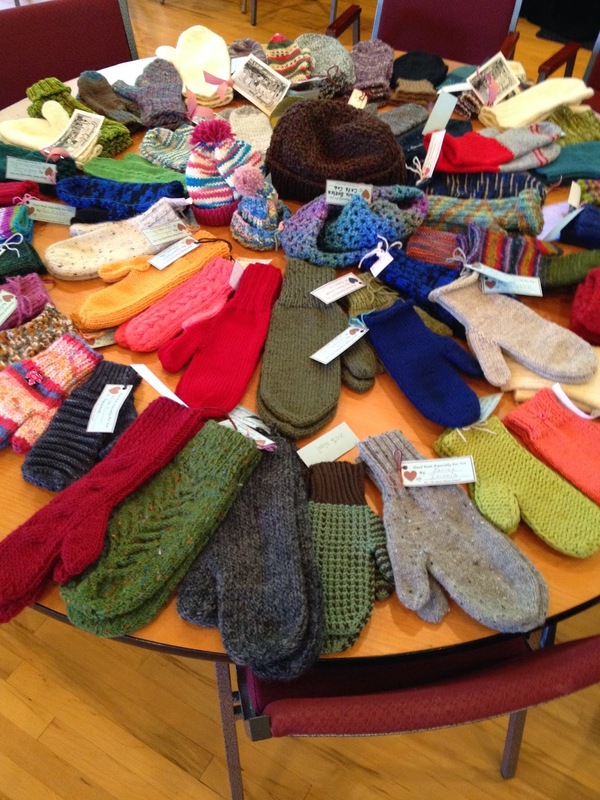 About 70 pair of mittens for The Maine Mitten Project! 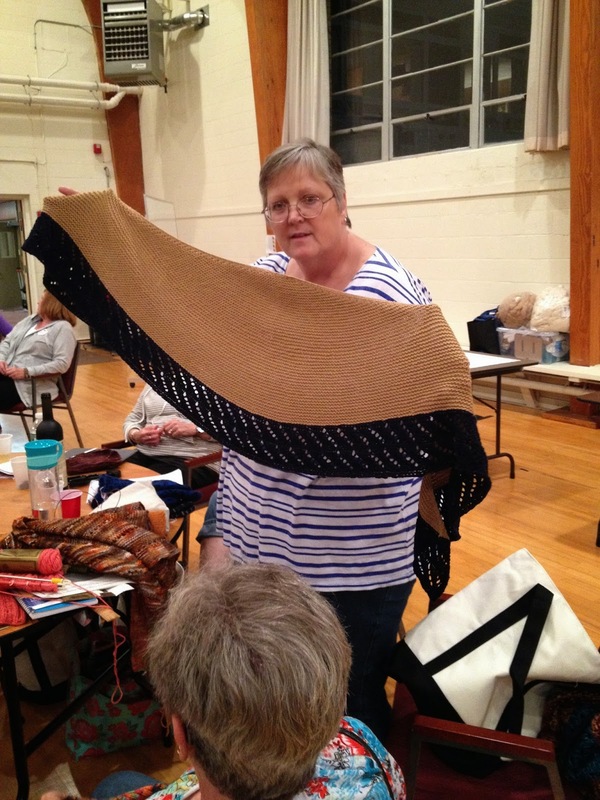 Susan B Anderson’s Waiting for Winter Mitts. Read her blog post here. Thanks to Michele of Three Bags Full for sending one of her lovely project bags for a door prize. 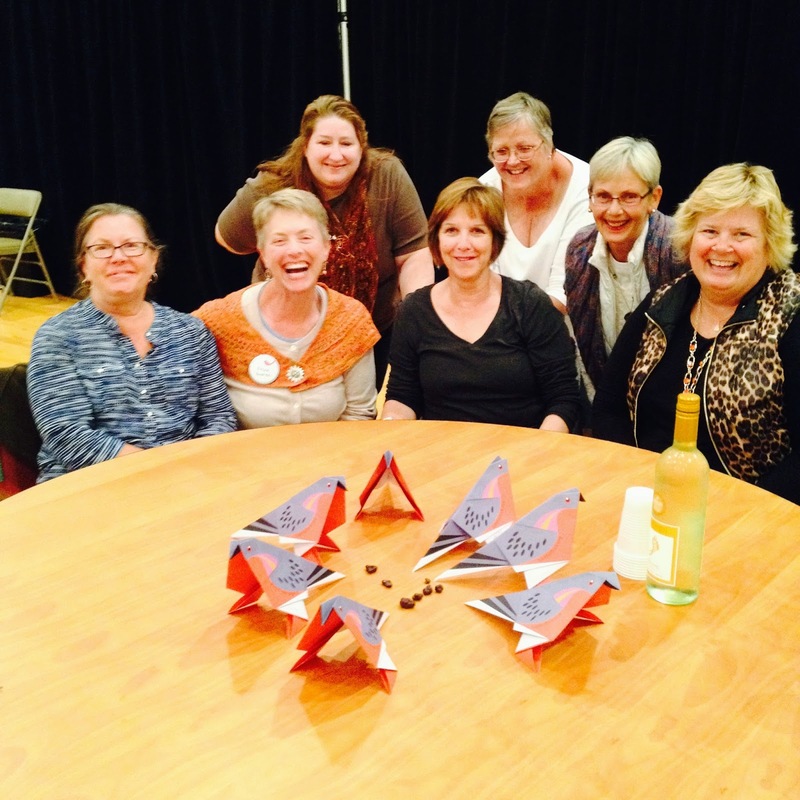 Kelly, Susan B Anderson, DebbieME, and KristeB with Fold the Flock contributions. Good job! Thank you to everyone who came and to all the wonderful helpers! Paula, great episode and blog post. The pictures are wonderful! I have a good one of you at RC WRC with binoculars that I'll send. 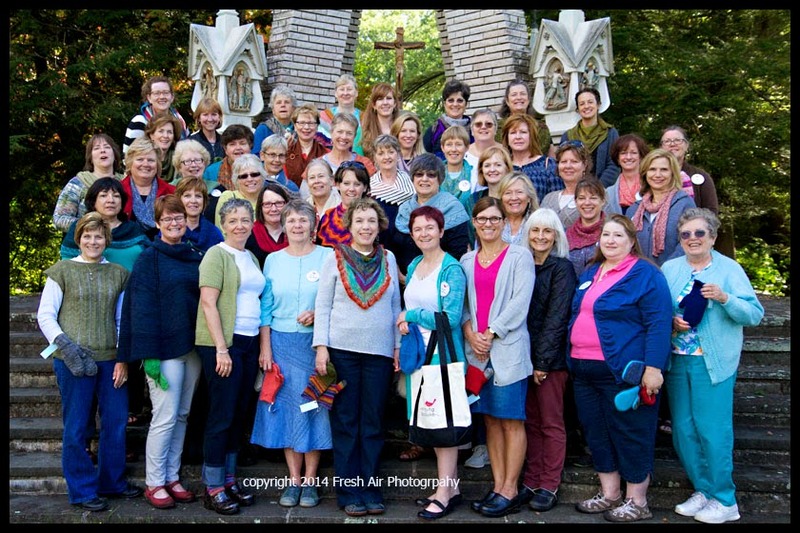 A perfect retreat and a wonderful fellowship of knitters. I can't believe we are doing it again next year! The frog on your mailbox is great photo too. Thanks for you Knitting pipeline information that give me a clear ideas of this and inspire this to do some creative. potable water pipelining Save time and money on repairing broken pipes. US Sewer offers Sewer inspection and cleaning with Robotic Televised inspection equipment. 24 hour emergency service is available for all clients. Free estimates.